Try our Pot of Gold Mimosas. Made with champagne, orange juice, vodka and blue curacao, they are perfect to serve any time, but we especially enjoy them for St. Patrick’s Day. 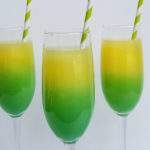 If you love mimosas, you really need to check out this awesome recipe for Pot of Gold Mimosas. Simply put, these are a step above! 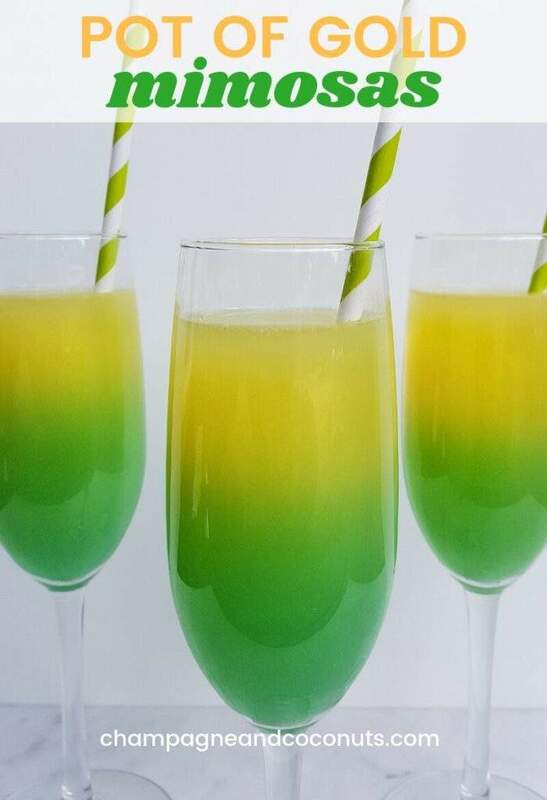 First off, these Pot of Gold Mimosas as so colorful! With their bright and festive colors, they are ideal for any extra special occasion. Serve them up at your St. Patrick’s Day party, for anyone who isn’t a fan of green beer. Share a batch with your beloved for Valentine’s Day. Or surprise your mom during Mother’s Day brunch with this extra-special cocktail. These Pot of Gold Mimosas are so yummy and refreshing – it’s possible that they should come with a warning label so you don’t overdo it. Made with orange juice, vodka, champagne, and Blue Curacao, these tasty drinks can really pack a punch. But if you’re concerned about the alcohol content, the mocktail version is absolutely delicious. (And your kids are sure to love them, too! I hope you’ll whip up a batch soon. If you do, please let me know! Our Pot of Gold Mimosas are perfect to serve for St. Patrick’s Day, Mardi Gras, Easter, and even Mother’s Day! With their delightful, colorful appearance, it’s always a good time to serve a delicious mimosa. And the mocktail version is perfect to serve for the kids! 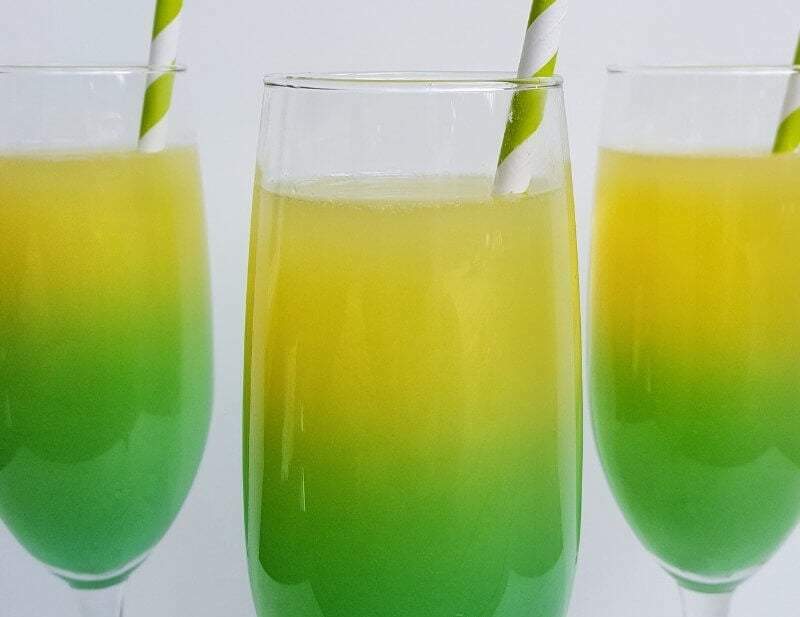 The blue curacao mixed with the orange juice makes such a a vibrant yellow and green colored drink, that’s it’s even perfect to serve during football season if you’re a Greenbay Packers fan. To make these mimosas without alcohol, you’ll omit the vodka and replace the Champagne with Sparkling White Grape Juice. You’ll also replace the Blue Curacao with Blue Curacao Syrup. You will need to use a bit more orange juice and grape juice to your taste. Pour 2 oz of orange juice into 4 champagne glasses. Add in .5 oz of vodka into each, and stir. Top off with champagne leaving a bit of room at the top. Quickly pour in .5 oz of blue curacao, so it settles and mixes at the bottom creating a layered effect. Our Pot of Gold #Mimosas are perfect to serve year-round, but especially for St. Patrick's Day. Made with champagne, orange juice, and blue curacao. To make these mimosas without alcohol, you'll omit the vodka and replace the Champagne with Sparkling White Grape Juice. You'll also replace Blue Curacao with Blue Curacao Syrup. You will need to use a bit more orange juice and grape juice to your taste. Please let us know how you enjoy our Pot of Gold Mimosas recipe. If you make it yourself, please let us know on Pinterest that you tried it and tag us with #champagneandcoconuts on your Instagram photo. If you haven’t had a chance to make it yet, be sure to save the recipe on Pinterest so you’ll remember where you found it. You may enjoy following our Pinterest Boards, Mimosa Recipes and St. Patrick’s Day Cocktail and Mocktail Recipes.